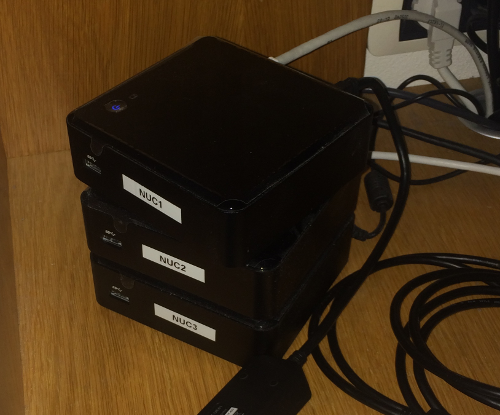 Being a happy owner of a couple of Intel DC53427HYE NUCs NUCs, I decided I would install TripleO on them. I won't dwelve too much into the details of TripleO, see the official docs if you need more information: http://tripleo.org/, but here are the steps I took after installing Centos 7.2 and applying this http://acksyn.org/files/tripleo/nuc.patch. Sleep modes. Since I turn off the NUCs via a power switch and because it puts the AMT processor in sleep mode and it needs an ICMP packet to wake up, which can take up to 25 seconds, I just went ahead and disabled the AMT Power Saving Policy by choosing: "Mobile: ON in S0". If you do not do this you might have to tweak the max_attempts and the action_wait parameters under amt in /etc/ironic/ironic.conf on the undercloud. It is because the protocol string (in this case 'http') passed from ironic to the driver is actually u"http" which confuses the openwsman SWIG bindings. This is something I need to look at in more detail.